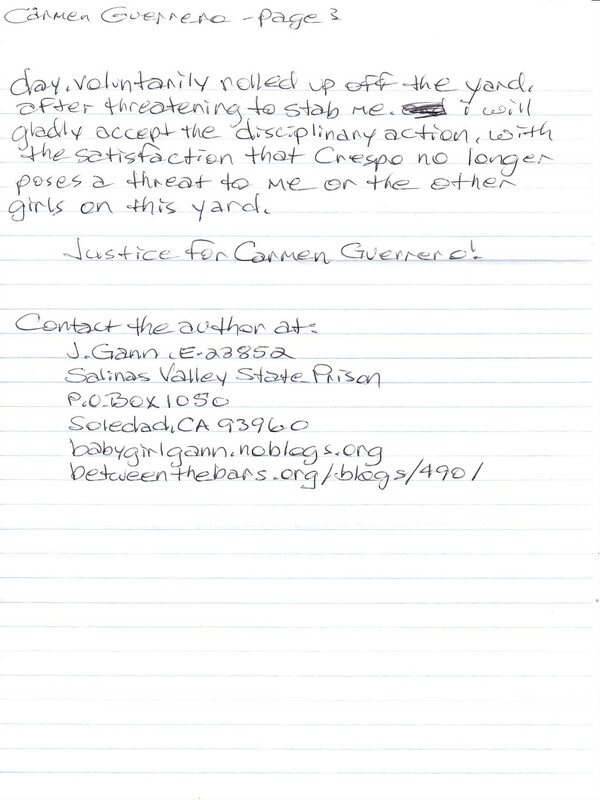 Updates And Writings | FREE BABYGIRL! 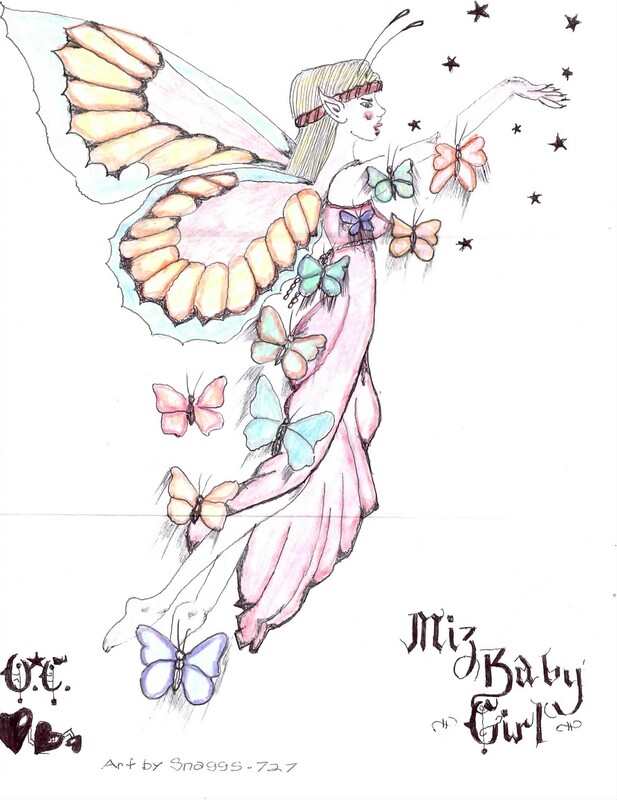 Babygirl received some uplifting messages this past June 11th that she wanted to share with you. It means a lot to be acknowledged by one’s community. Let’s remember to send some love to our comrades on the inside to let them know they are not forgotten! 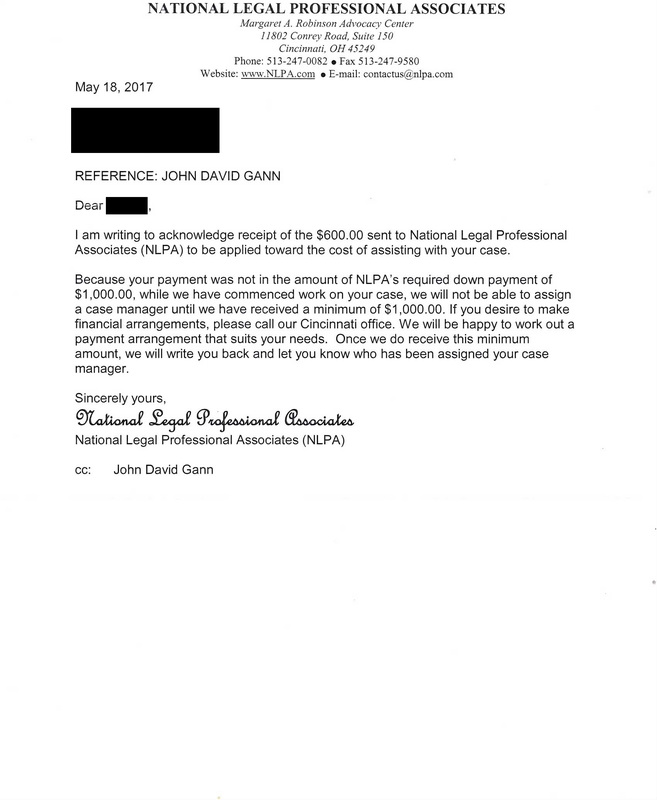 Below is an acknowledgement from the NLPA of receiving a total of $700 towards NLPA’s $1,000 down payment fee. We are so close to getting the total needed for the NLPA to assign Jennifer a case manager and getting her the legal counsel she needs, only $300 away! This small amount of money can help get Babygirl to freedom. Please donate what you can to support Jennifer’s legal struggle and chance for freedom. 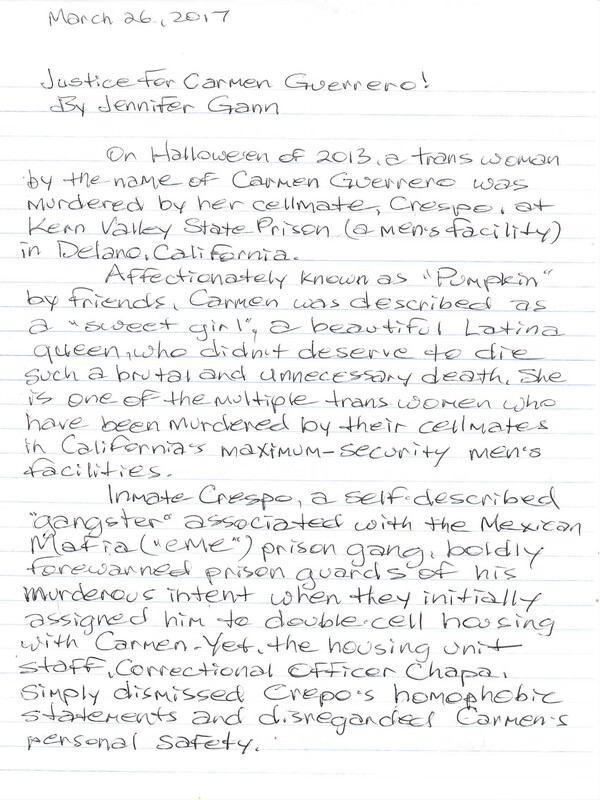 Jennifer Gann is a trans woman and anarchist prison rebel who has been held captive since 1990. 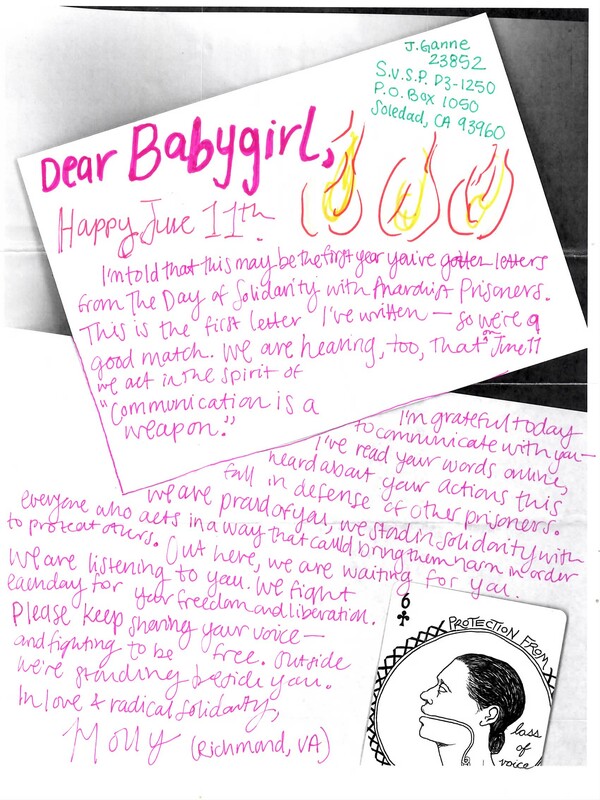 While serving a seven year sentence for robbery, she became politicized during the 1991 Folsom Prison Food Strike and survived more than a decade of torture in solitary confinement at Pelican Bay SHU. She was convicted of the non-violent prison offenses and given multiple 25 year-to-life sentences under the “Three Strikes” law, but now qualifies for a sentence reduction under California’s Proposition 36 and early release under the newly enacted Prop. 57(which Governor Brown supported!). 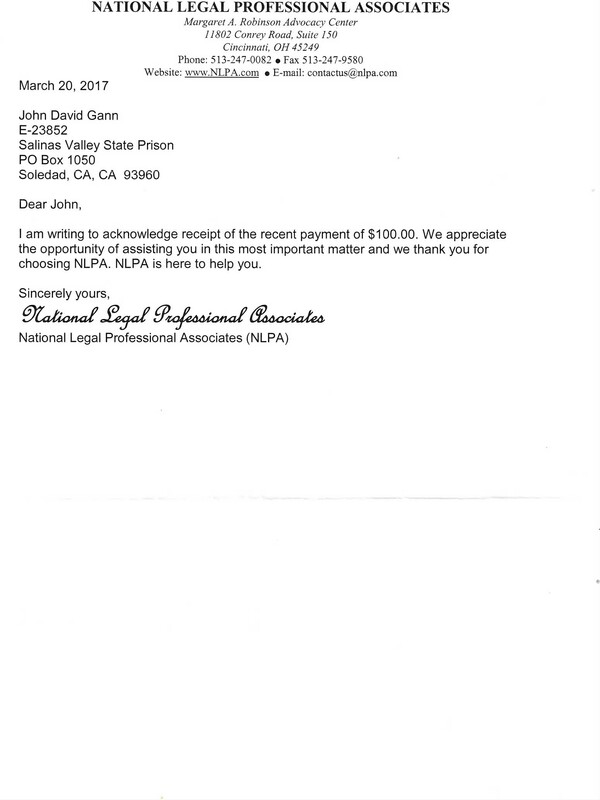 National Legal Professional Associates(NLPA) has agreed to join my legal defense team, to provide technical consulting and research assistance with respect to post-conviction motions, appeals sentence modifications, and clemency/pardon applications at a reduced rate! They have an excellent track record and unequaled expertise in criminal defense for the past 28 years, which will help offset the government abuse of power! NLPA will provide a complete and comprehensive case evaluation which will help me and my attorney put together a “game plan” for fighting my conviction and/or sentence. This case evaluation will include: personalized case research concerning the issues that apply, a factual statement of my case, an evaluation of sentencing guidelines, a summary of procedural sentencing defects, possible ineffective assistance of counsel, and a complete review of the entire transcript of legal proceedings in my case. This would address not only court action available in attempting to reduce my time or overturn my conviction, but would also address alternative remedies that may be available such as: Expunging/Sealing/Overturning prior convictions, Pardon/Clemency applications, New Rules of Evidence that may be available for out of time situations, etc. The evaluation fee $2,950 and is able to be paid on an installment plan with a down payment of at least $1,000. With California’s newly passed Prop 57 and my appeal still pending, time is of the essence! Thank you for your support and Solidarity! You can also donate to Babygirl’s fundraiser here.